This is a cheat’s variation of the classic French tart and makes an impressive pudding to serve with lots of cream, ice cream or crème fraîche. 1 You will need a 23cm (9in) round, fixed-base cake tin, at least 5cm (2in) deep. Preheat the oven to 220°C/200°C fan/Gas 7. 2 Sprinkle the sugar over the base of the tin in an even layer. Arrange the plums on top of the sugar, cut-side down. 3 Roll out the marzipan to a round slightly smaller than the tin and place on top of the plums. 4 Roll out the pastry just a little bit bigger so that it is the width of the cake tin. Place the cake tin on top of the pastry. Using the tin as a guide, cut around the tin to make a circle, then lay the pastry over the plums and tuck the edges of the pastry down around the fruit. Make a small cross in the top of the pastry to let the steam escape during baking. 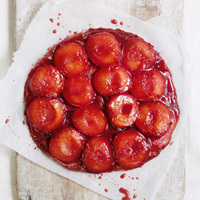 5 Bake for 25–30 minutes until the pastry is crisp and golden and the plums are tender. Loosen the edges of the tarte then turn out on to a plate and serve.